Available with Data Reviewer license. The Data Reviewer custom steps and tokens can be used to automate selected Data Reviewer functions as part of a workflow. These steps and tokens allow you to create and delete Reviewer sessions for your job, run Reviewer batch jobs directly from a workflow, and automatically start the job's Reviewer session. 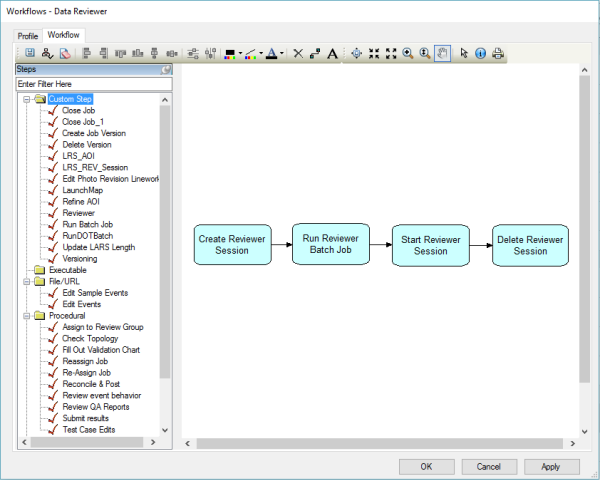 The Data Reviewer custom steps are included in the Production Mapping and Reviewer step libraries. The steps, a basic description, and return codes are outlined in the table below. See Creating step types for general information on configuring step types. 0—Batch job executed successfully, and no results were returned. 1—Batch job executed successfully, and results were written to the Reviewer session. 2—Batch job failed to execute. 3—Batch job executed successfully with errors or warnings, and no results were returned. 4—Batch job executed successfully with errors or warnings, and results were written to the Reviewer session. 1—Failure (One or more Reviewer sessions could not be deleted). 2—Failure (Reviewer sessions deleted, but job info could not be updated). All processing information is written to the History tab in Workflow Manager. An additional token is available when working with the Data Reviewer custom steps. See the Tokens topic for general information on working with tokens.